Papergreat: Advertising trade card for J.P. Julius piano store of York, Pa.
Advertising trade card for J.P. Julius piano store of York, Pa. I reckon the Ephemera Blogging Statue of Limitations1 has passed, so now it's my turn to write about the card. J.P. JULIUS — PIANOS.Owing to the demand for Pianos steadily increasing every year, I have decided to make a specialty of Pianos, and have prepared myself with a large assortment for the fall trade. These goods are all new, very latest designs and woods; best standard makes, such as Steinway, Stieff, Sterling, and Wissner, &c.
I sincerely hope that the Piano purchasing people will appreciate my efforts to give them a good selection of standard makes, and give me a call to see what I can do for them before buying. Store now open every evening. The Sterling Piano at Julius'has made a reputation for itself in the city of York, and has gained its place at the pinnacle of piano popularity; besides being popular, the Sterling piano is highly recommended and used by York's best musicians. You will never regret the investment if you buy a Sterling piano. 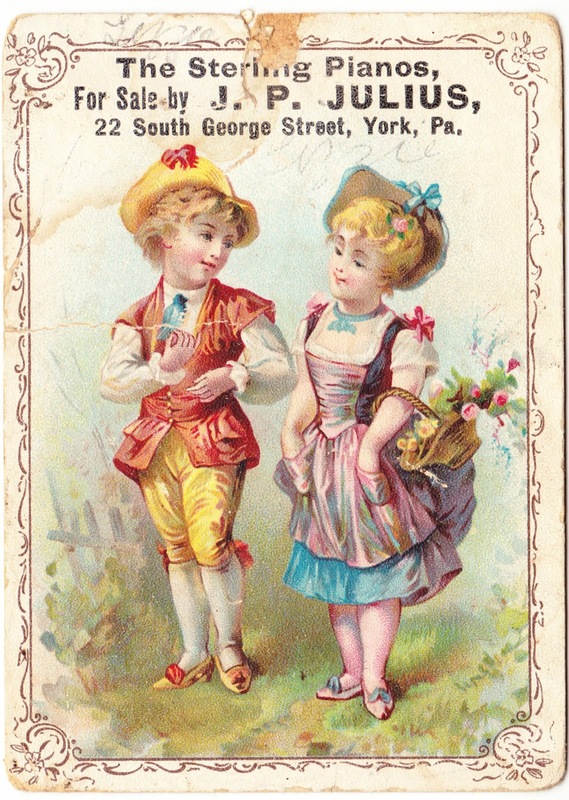 So, we can say that this advertising card dates to sometime before December 1905, as the street address of the business was different at that point. As far as the back of the card, Joan detailed it seven years ago on her blog: "This even has writing on the back – the name 'Lizzie S. Misener' is signed, and under that is written 'Alfred Tennyson.' Is it THE Alfred Tennyson? Was Lizzie just practicing her penmanship? These things we’ll never know." Lizzie's full name was probably Elizabeth S. Misener, but some initial searches didn't find anything under that name. Maybe Mark Felt or one of Papergreat's other sleuths will uncover something. I'm guessing that Lizzie was born sometime between 1880 and 1900. 1. Not a real thing. Seriously, this is very cool. I will make sure I add a reference in that Weaver post to this extra info. People are always asking me about them.